Accommodation: Personal Residence, Private Beachside First Floor, Large Master Bedroom/Bath (King Bed), Stream Shower, Garden Tub, Separate Twin-Beds/ 1/2 Bath, Accommodates 4 Adults> Note: Children are accommodated with prior owner approval. The 'Beach Suite' is a Completely Private Lower Floor (Over 1,400 Sf) of a Newly Constructed Three Level Private Residence (No Condo Here) with Private Parking, Two Decks, Large Dock and Boat Slips on Large Private Beach in Lakeside. Large Master Bedroom, King Bed, Private Bath with Steam Room for Two Adults. Separate Sleeping Area with Twin Beds and 1/2 Bath for Two Additional Adults. Kitchenette, Microwave/Coffee Pot, Refrigerator, Utensils, Dishes. Large Gas BBQ on Private Deck. Linens Provided, Washer/Dryer. Living Area with Gas Fireplace, 42' HD Flat Panel TV, Wireless Internet. All Downtown Lakeside Restaurants and Amenities Within Short Walking Distance. 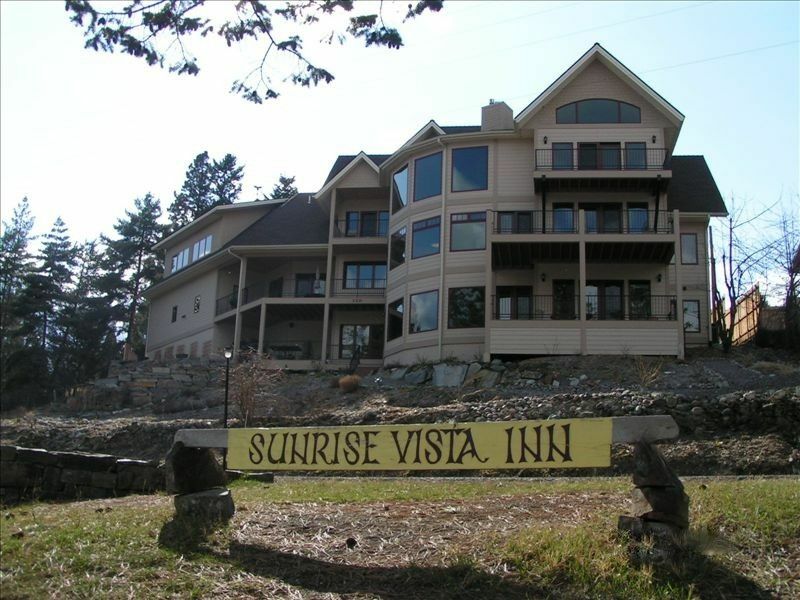 Sunrise Vista Inn Motel Rooms (8) Available (May-Sept) on Site for Guests, Friends and Family, Can Be Rented individually by day or in conjunction with the 'Beach Suite' for Weddings, Receptions, Reunions, Etc. on Beautiful Flathead Lake. Gregg & Marci are the Managers and they can answer your questions and schedule your Vacation Rental and the Motel (8 rooms) as well. Note: The small 8 room hotel on the same property gives us the ability to host weddings, family reunions, weekend get togethers etc. We have been married for 37 years and have 5 children. We had lived and worked in the Glacier Park-Lakeside area years ago until my job took me to Alaska and Eastern Montana. When I (Gregg) decided to retire in 2018 we looked for something to do part-time. Marci was a motel front desk manager and I retired as a Facility Manager. My wife found the motel and VRBO business in Lakeside, MT. We moved here last April and took over the business and love living back in Beautiful Lakeside, MT. The Flathead Lake area is absolutely beautiful. There are so many thing to see and do. Boat, Jet Ski and Kayak rentals, Horse Back Rides, Walks on suspension bridges in the trees, Swimming, Fishing,. Hiking, Great shopping, Wildlife viewing and so much more. And, of course, Glacier National Park- a must see on everyone"s bucket list. Galley Kitchen-utensils, knives, spatula, etc. Within a short walking distance are Restaurants, Casinos, Brew-Pub, Hardware Store, Grocery Store, Post-office, Church's, Pharmacy/gifts, Medical Services, Boat Rentals. A place to store your own boat trailer is available on site, and the private dock is available for your own boat. Beautiful large swimming beach with fabulous views! Nice and relaxing. Greg was fabulous to work with, very accommodating. We stay here every year. Absolutely beautiful. Stunning views, big windows and meticulously clean! We will be back! We loved our stay at the beach house. It has huge windows, comfortable furnishings and is meticulously clean. Absolutely beautiful. The dock is furnished with cozy dock chairs and has a spectacular view. It was the perfect place for us to stay before taking our daughter to college in Bozeman. The manager, Gregg Johnson was very helpful and very friendly. We will be back! This place is right on the lake with a large beach and dock. The place was very clean and in great shape. Gregg is an amazing host offering ideas for activities, dining and ready to help with anything we needed. This is a great location. Close to Glacier National Park for scenic drives, tours, hiking and fishing. We rented kayaks in town and paddled to the house for lunch before heading back out on the beautiful lake. Highly recommend this place! I'd give it 4-1/2 stars, please see why. 5 Stars: We enjoyed staying in the beach suite this July on Flathead Lake. The unit has beautiful views of the lake through the curving living room windows and two decks. To sit out on the deck is fabulous. The master bedroom suite and bath are enormous and well appointed. Gregg, the manager, is excellent, friendly and helpful. We enjoyed our stay. Additional excellent points: location, access to the beach, size. 4 Stars: A couple constructive criticisms on the unit: We'd love it if there were two burners in the kitchenette. You need to use the grill or an electric fry pan. We cook so it would be better to have a couple burners. The two twin beds, according to our adult children, were bouncy and may need to be replaced. Probably fine for kids. We really enjoyed our stay at this lovely and very comfortable property. The views are spectacular. And if you like to do more than spectate, it’s a short walk down to the semi-private dock to enjoy firsthand the wonderful Flathead Lake. Propery managers Gregg and Marci were excellent and very helpful. We will be back! Many thanks for your excellent review. We surely look forward to seeing you and your entire family next year! We had a fantastic stay, Janet was a super host and always available when needed. We made good use of the BBQ that is available on one of the two decks overlooking the lake. Thank you so much Andy and guests!! It was a pleasure to have you all. Safe travels and i hope we meet again!!!! Restaurents, The Docks, Tamarack Brewpub and Eatery, Homestead Cafe, Spinnnaker Casino, Boat and jetski rentals, Hardware store, Grocery Store, Churchs are all within a short walking distance from the Beach Suite. Art Galleries,Gift Store,Banking,Gas Station.